As I squeezed into the lift to the sixth floor, elbow to elbow with other visitors, I wasn’t overly excited about this one. I’d seen photos of the gimmicky flamingos and palm trees in this popular corporate events venue and the appeal of a local community coming together around a square of ancient plane trees and newly planted perennials was somewhat lacking. But having walked past the building many times over the last few months, there was something urging me on. Coming out of the lift, it looked exactly as I’d imagined: a pretty garden, particularly appreciated for its unlikely location, but the design was not going to set the world on fire. It was interesting to see the exotics that happily grow in a walled, London microclimate, but the whole Spanish flamingo thing didn’t seem entirely with taste in such an abstract location. Taking photos through the busy crowds was tricky and slow and I turned towards the lift, not wanting to waste precious time when there were 200 beautiful garden squares to be seen. But the crowds saved me, as trying to inch my way back to the door I heard a lady say to her friend, “there are three gardens up here, you know, not just the Spanish Garden”. Aha! As I had previously read – but clearly instantly forgotten – the gardens were designed by landscape architect, Ralph Hancock, after the then owner, Trevor Bowen, visited the Gardens of the Nations at the New York Rockefeller Center and wanted some of the same. The three gardens comprising ‘The Roof Gardens’ opened in 1938 and incredibly, not much has changed since then, with several of the original trees still standing, in their meagre 45 centimetres of soil. Today, they have Tree Preservation Orders and the garden as a whole, a Grade II heritage listing. In the corner of the Spanish Garden a pathway led to the Tudor Garden, complete with red brick walls and mock Tudor arches. There were a number of lovely details but I think its appeal would be shown off best laid out with white table-clothed and floriferous table settings, as their brochure demonstrates. It was mostly large, bare expanses of grey flagstones and not-particularly-thriving shady beds. It can’t possibly be real…but it is! But then I turned the corner into the English Woodland Garden, and all was forgiven. My first sight, two pink flamingos, sifting through silt on the bottom of the woodland pond: I was hooked! All my prejudices went out of the window and I stood, staring at them in bewilderment. It was such an amazing sight. The flamingos seemed pretty happy with their lot in life and indeed two of them are over 30 years old. And whilst their surroundings are hardly the Bahamas, for whom they are the national bird, I could quite see how happy they could be. For by far the largest chunk of the Roof Gardens was dedicated to a rustic English woodland theme. It has to be said that Mr Hancock certainly had some vision for this space. Mature oak trees dominate the skyline, between which, glimpses of the Houses of Parliament, Royal Albert Hall and the London Eye can be seen through decorative windows punched through the boundary wall. It is genuinely like walking along a narrow lane in rural England, only the odd flamingo stopping you in your tracks and bringing you back to reality, in the most ironic of ways. There are ducks too and even a life size cow, although they did stop short of grazing livestock on the lawns. The rusticity of the Woodland Garden makes it hard to believe you’re not in rural England…until a flamingo walks past. I think it is the vision and ambition that really got me. The setting out to do something quite unthinkable and achieving it wholeheartedly. When you think back to the 1930s, fashion was quite different, with Spanish themes and carpet bedding much more in keeping with the time. It must have been an incredible spectacle in a decade that we associate with the Great Depression and the start of World War II. Visitors were charged a shilling for entry back then, so whilst it may not have been accessible to all, the gardens raised over £120,000 for local charities. And so I liked the history and the ambition. I also liked the fun and moderate outrageousness of it. Just the doing something different. And speaking to one of the gardeners was a sure fire way to have me convinced. I told him how incredible I thought it was and he replied, “I know, I still can’t believe it myself”, in a humbled way that told me he adored his job and couldn’t believe his luck at working there. It was a lesson for me to remain open minded. 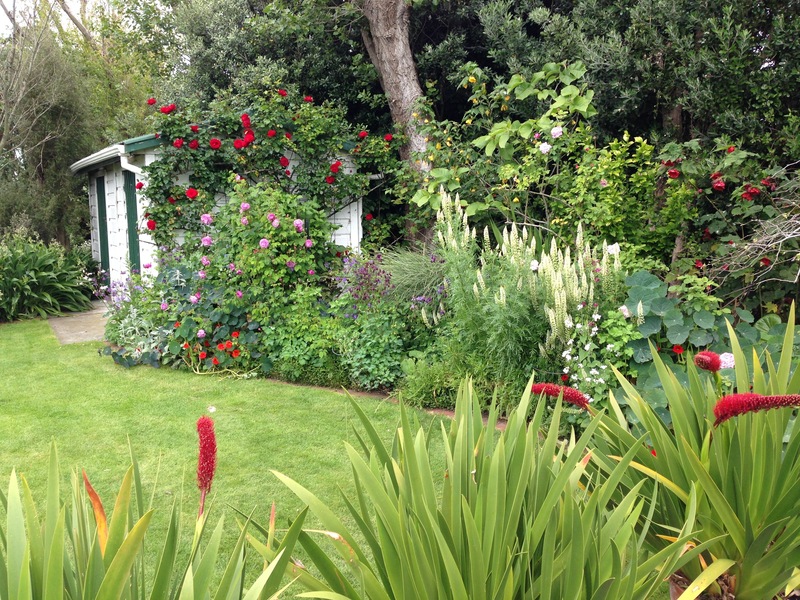 An important role for all gardens is to inspire, to lift, to re-energise their visitors. Beauty, so closely tied to nature and plants, is the classic means for achieving this, but there are many other ways to deliver the same result. This may be a corporate garden, run for the purposes of driving shareholder value, but it still has a history and its own personal stories behind it. Personal stories that make a garden a garden. That bring uplifting qualities to its visitors. Sometimes we just need to look a little harder; to find inspiration from a broader range of ideas. Hard work, a big vision, creativity, the application of love or indeed, a beautiful end result can all lift us and leave us feeling refreshed and reinvigorated. The more we look, the more we gain. Keep looking, one and all! Deckchairs by the stream in the Woodland Garden. G&T anyone? Hi Fiona. Looking at this, you have very successfully managed to comment! This hasn’t come through as an email, but do let me know if you’d prefer it taken down – I’m sure I can do that through WordPress somehow. So exciting to hear about your travels and return to Florence. Do let me know of any gardens you see along the way that you think I ‘need’ to visit. All good here…will email soon. Not so convinced by the cow.. but the rest is delightful. That roof must be seriously reinforced. I mean, an oak tree?? And it wasn’t just one oak tree. That very first photo shows just how established the whole thing was. Incredible. Nice cheerful-looking place. What building is this garden on top of? Clearly wind can’t be a problem!? An oak tree on a roof in 45cm of soil in Wellington – hahahaha! It used to be a department store but I think it’s now a mix of retail and offices. As I was standing up there I was grateful to live several blocks away, I have to say. I don’t know if they have any clever tricks up their sleeve that we don’t know about, as it’s hard to imagine how they survived the 1987 storms. Beautiful idea, though I agree with Sarah if it is possible in other locations. I watched Grand design Australia about a house build in Sydney where they planted a roof garden. Looked pretty impressive on the program but I searched it on google walk and what I saw was NOT. All the plants were dead. 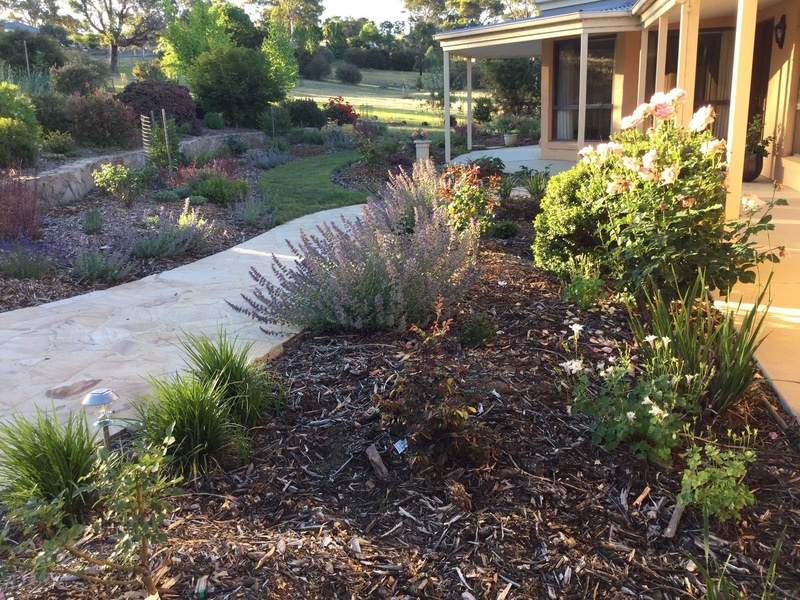 So, well done Kensington for keeping this garden soooo alive and pretty… and thank you Janna for such a great report, I always look forward to your posts. Thanks so much, Barbara. It’s definitely much easier to do things like this over here. Things just don’t dry out in the same way. I’m sure the scale of this garden also helps as the vast number of trees create a lot of shade and protection for more delicate plants: a distinct microclimate has been created, which would be very hard to replicate on a smaller scale. I love the idea of green roofs etc but they do have to be practical for the local climate. What amazed me the most is that it was all done almost 80 years ago and the building is still standing! I too wondered about the wind and that oak tree having just seen my tall hedges at 45 degree angle in last week’s winds. I thought from your original comment that, like the cow, the flamingoes were sculptures – what a delight that they are not. Maybe a topiary cow would fit better! What a great place though for people to enjoy. Hmmm 45 centimetres of soil – makes me ashamed of my scrappy pot plants and their hydrophobic soil- no excuse. Thanks Janna – interesting as always. It’s a pretty solid stone building; it would have to be really! I don’t mind the cow: it’s certainly quirky, although I do like the topiary idea, too. For me, I either like something to be real, or to clearly be artwork, i.e. not pretend to be real, so both the flamingos and cow fit that criteria. I’m never keen on ‘fake’ things somehow; they lack ‘soul’ to me, offering neither life nor creativity. And don’t be ashamed of your pot plants; it’s a million times easier here! It was a tonic to read your article having come from a very wet cycle ride. I am inspired by people who create so much out of so little. We are blessed Janna for having you to share these gems of which we would know nothing about. You are very sweet, Elizabeth, thank you. I’m so glad you enjoyed reading about this incredible garden. And I can sympathise with you about the rain. I’ve sadly been rained off a garden visit today that had been in the diary for some time with a new friend of mine. Fingers crossed, next week! Thank you for doing a post on this garden Janna. I’m becoming increasingly interested in the concept of garden roofs and this garden didn’t disappoint. Certainly there are elements that don’t appeal to me and I question the need to put a large tree on any roof BUT the vision, history, plantsmanship and yes, even the 80 year old design are amazing. I would love to see many more such gardens grace the rooftops of Australian cities, not just a token raised garden bed. Each time I fly in/out of Perth I am horrified at the deminishing green space and the accompanying increase in rooftops. I have seen some incredible computer-aided designs of high rise cities full of green walls and roofs; it is so inspiring to think what we could have. But I do think we have quite a way to go to find the technology and horticultural expertise to really make these sustainable on a large scale. I do feel optimistic that things will improve on this front though. Wouldn’t it be wonderful to fly in to a city and see green beneath us, buildings or no buildings. Bliss! The gardens look wonderful. I always like to see greenery around buildings, but this is really taking it to a new level! I could not believe my eyes when I saw and read about the oak tree…I’m not sure I would be comfortable with an oak tree growing on my roof! It was utterly surreal to see it all! Makes you realise what is possible. I agree, greenery makes the world of difference in built up areas. The more the better in my view. What a marvellous tour of this amazing garden, thank you Janna. With so many people about you did really well with your photos too. Thanks, Kate. I had to be pretty patient, which is not a skill I am known for! Glad it came across OK. Given how close it is to me, I’ll have to get back there another time. It is open to the public when there isn’t an event on, it’s just that events are on pretty much back to back. Another interesting blog Janna. I am still not sure what I think about rooftop gardens especially with trees. It does seem to be a very healthy environment though given your photos. Puzzling how trees and plants can grow in such little soil. It seems you were very patient to get those photos. There is definitely a ‘gimmicky’ aspect to these gardens, isn’t there? But now living in the middle of a very busy city, I can absolutely see their place in the world. The only type of unused space we have lots of is roof space, so if that’s the only substantial place for trees (and they are safe, which they seem to be), then I say, the more the better. I think it is very different in Australia, where succulent plant types are really the only sensible options for these spaces, but as you suggest, if we can find plants that thrive in a particular environment, then why not? ‘Right plant, right place’ has to be the most important gardening motto of all. I’ve never been up, for all the negative reasons you’ve given, and because I’ve been too lazy. However, you have opened my eyes a little with your excellent post and I might put Kensington Roof Gardens back on my list. The woodland garden is impressive, given the location. I am less drawn the other two spaces, but stick a flamingo, a peacock or pretty livestock in any setting and I am there! Yes, you should go; it’s quite an experience. I was amazed how much I loved the flamingos. It would be easy to sit on one of the deck chairs watching them for hours. And after you’ve done that, be sure to come round the corner to ours for a cup of tea/glass of wine.